Advantages: Book: Interesting story of an overlooked aspect of aviation history; five colour four view illustrations plus four side profiles; decal tie-in (available separately); many helpfully captioned photos; covers history, operations, camouflage and markings; full text and captions in both Dutch and English. Recommendation: Highly Recommended to early-war aircraft enthusiasts and modellers. The fifth release in the Dutch Profile series is "Fokker D.XXI/D.21 - Operations of the LVA/ML Fokker D.XXI". 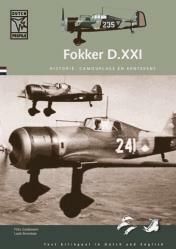 This book covers the Fokker D.XXI in Dutch service. The Luftwaffe lost almost 400 aircraft in their campaign to conquer the Netherlands, partly due to the creditable performance of the Fokker D.XXI. The 60 pages provides detailed historical text presented in both Dutch and English, lots of great reference photos, five colour four view illustrations plus four side profiles, and drawings. As the title implies, the narrative focuses primarily on operational order of battle from the beginning of hostilities until the destruction by the Dutch of nine D.XXIs on 14 May, 1940. The photos and profiles are excellent. This book also provides reliable information on the camouflage and markings of RNAF Fokker D.XXIs. One revelation, to me at least, is the palest of the three upper surface colours, Camouflagebeige. This has traditionally been depicted as a sand yellow, but it appears to be a much more neutral shade, almost grey. Fokker fans will find plenty to keep them entertained between the covers of this new book. Once again, Dutch Profile is offering decals to tie-in with this book. The decals are available separately. 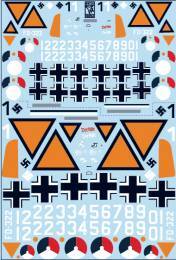 The sheet includes markings for seven Fokker D.XXIs in both 1/72 and 1/48 scales. Bonus markings are also provided for a Messerschmitt Bf 109 E-4, brought down by a Dutch pilot on 10 May, 1940. The decals are produced to the same high standard as Dutch Decals earlier releases, with thin carrier film and generally good registration. Instructions are very good, with text descriptions in Dutch and English, and four view diagrams as appropriate. DutchProfile's "Fokker D.XXI/D.21 - Operations of the LVA/ML Fokker D.XXI" is an interesting account of an otherwise underexposed corner of aviation, and will be welcomed by Fokker fans and history buffs alike. Thanks to Luuk from Dutch Profile for the review samples.